Located in Florence, this hotel offers free shuttle service to Cincinnati-Northern Kentucky International Airport, 5.6 miles away. It features an outdoor pool and guest rooms with free Wi-Fi. 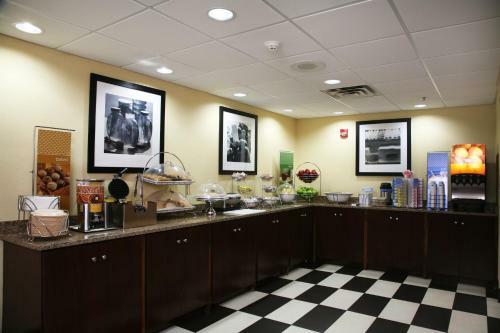 Rooms at the Hampton Inn Cincinnati Airport South include a microwave, refrigerator, coffee facilities and cable TV. The studios provide a seating area with sofa bed. A business center and a gym are available at the hotel. Cincinnati Airport South Hampton Inn includes on-site laundry facilities. A hot breakfast is served daily, while coffee and tea are available all day. The Hampton Inn Airport South is 10 miles from Newport on the Levee and Paul Brown Stadium, home of the Cincinnati Bengals football team. The Kentucky Speedway is a 30-minute drive away. the hotel Hampton Inn Cincinnati Airport South so we can give you detailed rates for the rooms in the desired period.